Elevated between 3392 ft and 8110 ft, the Ski Resort is among the 5 highest elevated Ski Resorts in the Bernese Oberland. The vertical drop from summit to base is 4718 ft. The average difference in altitude between base and summit of Ski Resorts in Switzerland is 2890 ft. Most runs are therefore relatively long. Grindelwald - Wengen is among the 15 best rated Ski Resorts in Switzerland. Season starts on Dec 1 and ends on Apr 22 (142 days). Average season duration in Switzerland is 112 days. Average snow depth during the season (Dec 1 to Apr 22) is 39 " at summit elevation and 9 " at base elevation. Snow coverage is usually best during February, offering an average snow depth of 45 " at summit elevation and 14 " at the base. 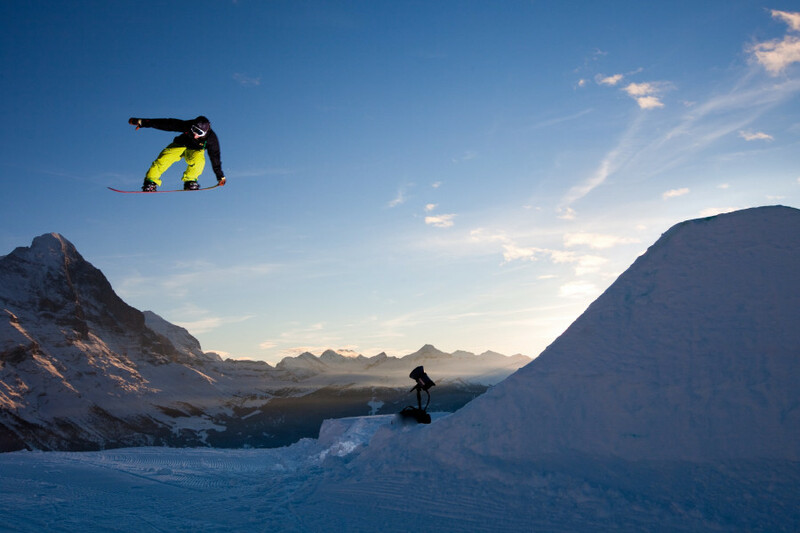 Therefore Grindelwald - Wengen is among the 10 ski Resorts with best snow conditions in the Bernese Oberland. Grindelwald - Wengen features 61 sunny days on average per season. 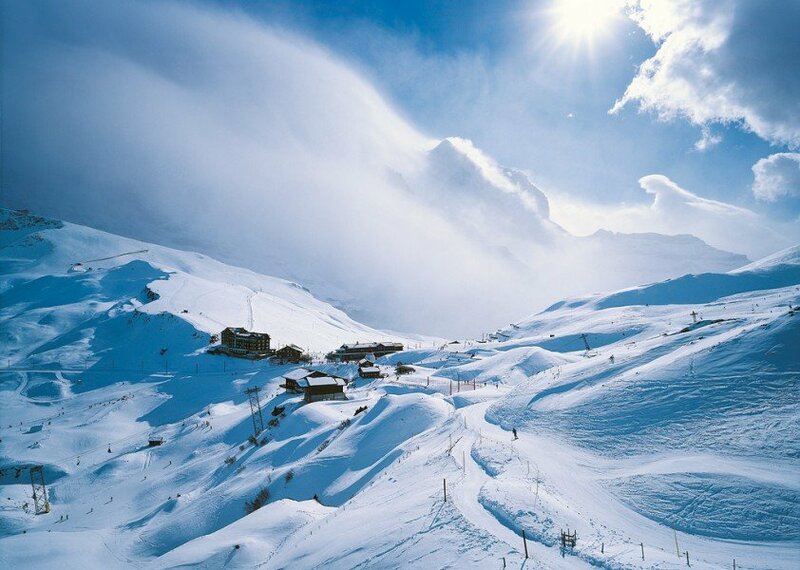 The average for all ski Resorts in Switzerland is 59 sunny days. February is the sunniest month with an average of 14 sunny days. Offering 63 miles of slopes and terrain, Grindelwald - Wengen is among the 3 largest Ski Resorts in the Bernese Oberland. The ski area Grindelwand - Wengen has around 110 kilometres of largely red-marked runs, offering plenty of exhilarating terrain for advanced skiers and snowboarders in particular. Beginners can also enjoy the feeling of skiing at the foot of Eiger, Mönch and Jungfrau, while there are also a couple of more challenging runs for experts. The Wengernalpbahn, Gondelbahn Grindelwald-Männlichen and Luftseilbahn Wengen-Männlichen lifts serve the ski area from Grindelwald and Wengen. Beginners should definitely check out the long blue-marked trails leading from the mountain station of the Fallboden chair lift via Kleine Scheidegg to Brandegg, while there are also a number of other easy runs to explore along the Läger and Männlichen chairlifts. 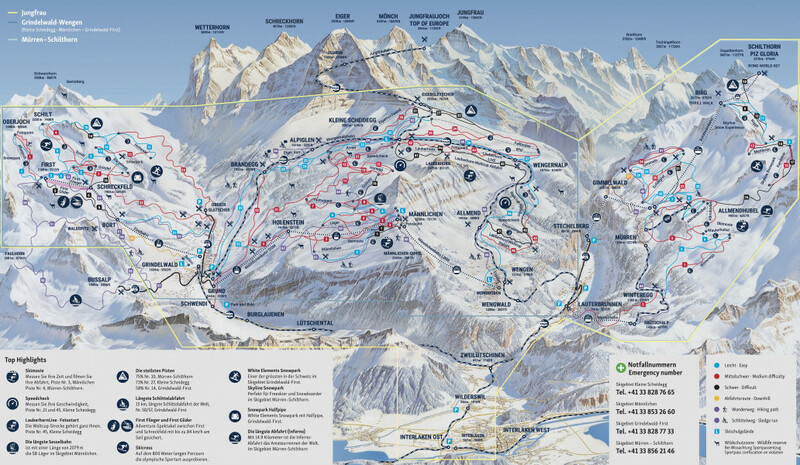 From the Mittelegg mountain station, you can even take a blue-marked run all the way down to Wengen in the valley. Advanced skiers and snowboarders will find just about all runs in the ski area manageable and enjoyable. Take the Eigernordwand chairlift up to 2,320 meters and the Eiger Glacier. This also marks the starting point of the red Punchball run. The Arven chairlift links up with additional intermediate runs leading all the way down to Grindelwald Grund in the valley. Experts should first make for the highest point in the ski area – the Eiger Glacier. The black-marked Oh-God and Black-Rock trails run parallel to the Fallboden chairlift. The race course between the Wixi valley station and the Innerwenger mountain station is a particularly intense, white-knuckle ride. This also provides access to the slalom run. Learning is fun for young skiers on the nursery slopes of Figeller in Wengen, and this training area is located directly in town, right behind the tourist information centre. Going hungry or thirsty shouldn’t be a worry in Kleine Scheidegg – Männlichen, as some ten ski lodges and bars are waiting for skiers and snowboarders. For meat-lovers, a detour to the 1995 Schigrill & Bar Gysibielen is an absolute must. At lunchtime they serve their legendary Nordwand Steak. Wash it down with a downhill coffee before hitting the slopes with a full belly and a spring in your step. Think deck-chairs, BBQ sausage, home-made soups and a jaw-dropping panorama. 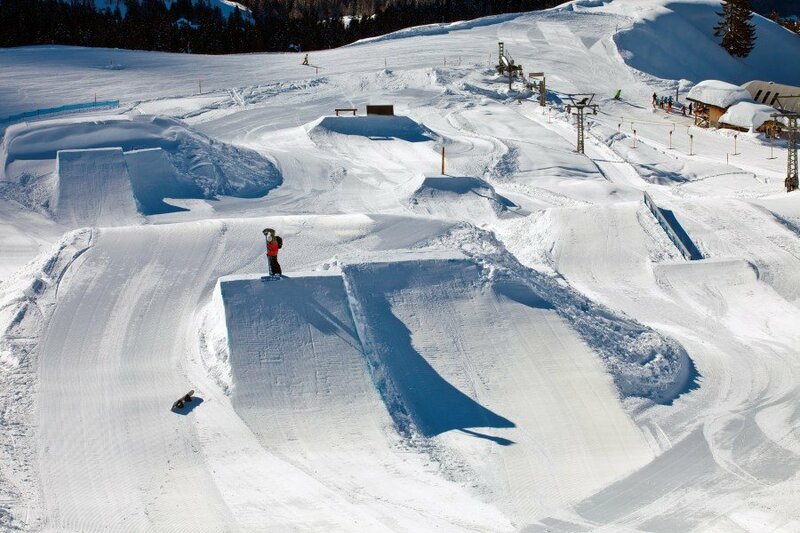 The Spycher-Bar is without doubt one of the most beautiful snow bars in the entire region. The main highlight for expert skiers in Grindelwald is the world-famous Lauberhorn World Cup course, which plunges 1,028 vertical metres down into Wengen over its 4.2-kilometre length. The longest run is the 13 km Lauberhorn-Grindelwald trail with a vertical descent of 1,380 meters – serious stamina is required for this one! Several other blue and red-marked valley runs also wind down into the valley resorts of Grindelwald Grund and Wengen. 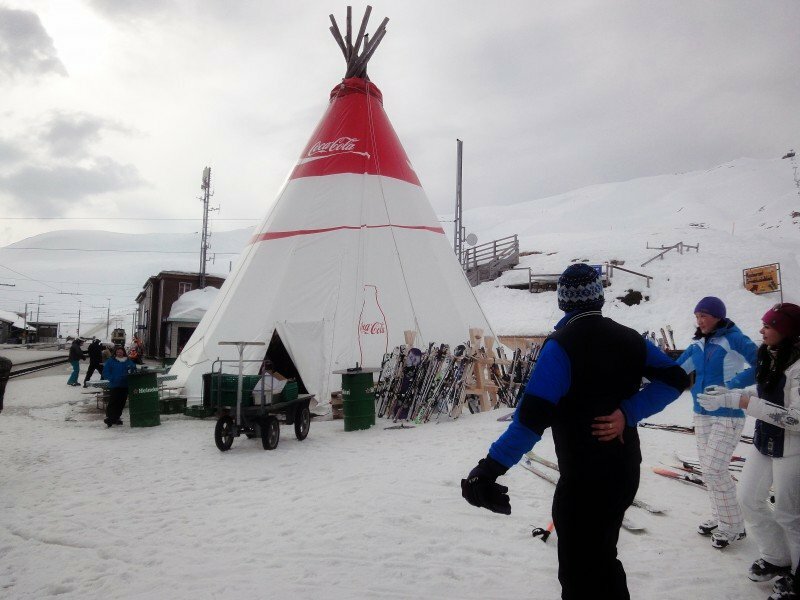 As a result, even beginners can take their time retreating to the valley after the lifts close for the day. 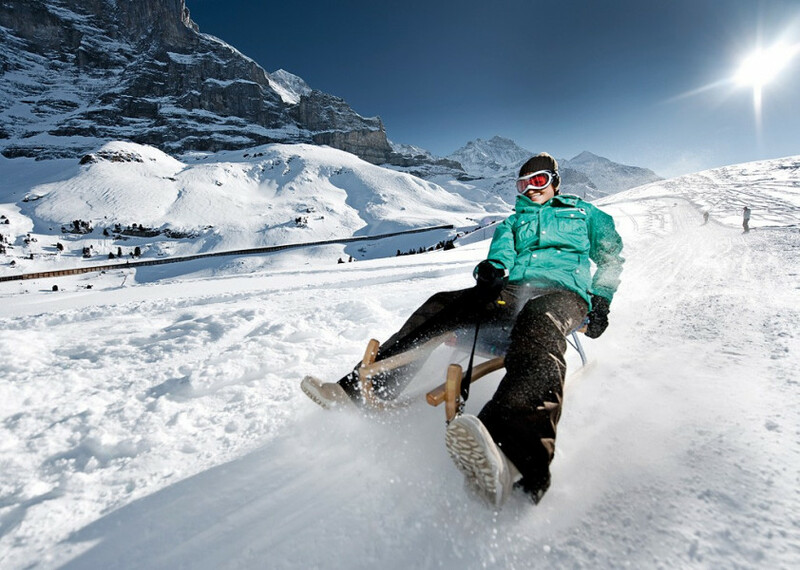 If that all sounds like too much hard work for your taste, Kleine Scheidegg – Männlichen also offers a so-called “slow slope” which actively encourages the most laid-back brand of skiing imaginable. Several sled runs also run down to Grindelwald and Wengen: The Eiger Run is a racy affair from Kleine Scheidegg via Alpiglen and Brandegg, while the Fox Run begins at the same starting point but runs down via Wengernalp and Allmend to Wengen. Ritas Speedway starts at the mountain station of the Holenstein – Männlichen gondola and plunges directly down to Grindelwald Grund. Winter hiking fanatics should look no further than the Standseilbahn lift up to Kleine Scheidegg from Grindelwald. After soaking up the amazing views on top, you can take a winter hiking path to the 2,230-metre summit of Männlichen. Alternatively, the route can be navigated in the other direction. The Schürlibar is a watering hole located directly by the valley run from Kleine Scheidegg down to Grindelwald Grund. It’s hard to imagine a better place to drink one for the road at the end of the day before making your final descent. Visitors also have a wide range of bars and discos to choose from in the valley after the mountain closes – the Mescalero Disco in Hotel Spinne, Plaza Disco in Hotel Sunstar and Bar & Lounge Aspen alpin lifestyle in Hotel Aspen to name but three. The restaurant Aspen alpin lifestyle in Hotel Aspen fuses Swiss tradition with a modern outlook, both in its style and culinary approach. Head chef Sebastian Schuster delivers outstanding dishes made with regional products in a contemporary lodge atmosphere. Gourmets don’t need to look much further than Restaurant Francais in Hotel Belvedere – the freshly prepared gourmet menus offer creative reinterpretations of culinary specialities. By car: If you are travelling by car, you can reach the Jungfrau region from Basel, Zurich or Geneva via Bern and Luzern/Prünigpass. If you are travelling from the south, take the Grimselpass or Sustenpass. Alternatively, you can access the region by taking the Simplonpass and the Lötschberg-Autoverlad. Wengen itself is completely car-free. If you are staying in the town, you can use the parking available in Lauterbrunnen. By train: The Jungfrau region is also served by the IC train service from Basel. If you are travelling from Zurich or Geneva, you have to change trains in Bern.